Phil Laak (pronounced “lock”) was born in Dublin, Ireland on September 8, 1972. He was given his nickname of “The Unabomber” because of the hooded sweatshirt and sunglasses that he frequently wears at the table. The sweatshirt was actually given to Phil Laak by fellow poker pro Gus Hansen. Phil Laak grew up in Wellesley, Massachusetts and earned a degree in mechanical engineering from the University of Massachusetts at Amherst. Phil Laak started playing poker in 1999, but didn’t accomplish much until he started playing regularly in poker tournaments in 2003. He finished sixth in the World Poker Tour’s Legends of Poker event in 2003. Phil won the WPT Celebrity Invitation in 2004, and has made several more WPT final tables since then. In 2005, Phil Laak lost against Johnny Chan in heads-up play to finish second in the $2500 Pot Limit Holdem event. 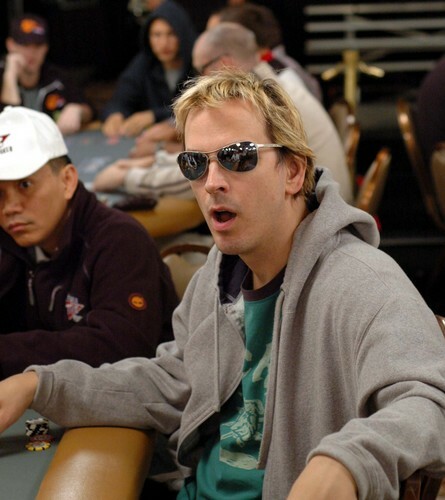 Phil Laak is well-known for his antics at the poker table. He will pull the strings on his sweatshirt to hide his face during big hands. He’ll do pushups and crazy dances after winning big, and he has kneeled besides the dealer when he’s all-in so that he could see the last card the instant it was dealt. These antics have earned him numerous fans who think they are hilarious, as well as numerous detractors, who think his antics are completely unprofessional. Phil Laak and Antonio Esfandiari are close friends and you will commonly see the two hanging out together. In 2007, the two began a partnership and recorded their first season of I Bet You, a popular cable television show on the MOJO channel. Phil Laak lives in San Francisco, California, and is currently dating actress and WSOP Ladies Night bracelet winner, Jennifer Tilly.